One of the most extraordinary stones – in my humble opinion, naturally – is the Tanzanite. 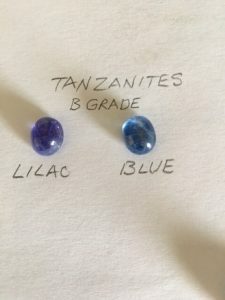 All stones come in a variety of colours, of course, but there’s just something about the range of colours in the Tanzanite that absolutely entrances me. The mauve of a Tanzanite is incredibly difficult to photograph and get accurate; it’s a bit like trying to paint or photograph Jacaranda blossom – you can see it’s mauve, but it’s never quite the right mauve, somehow. A bit too pink, a bit too blue, just not quite right. And then you see the stone in real life – or the Jacaranda flower – and you just relax into the colour. An a little known factoid… the American Gem Trade Association chose Tanzanite as the December birth stone in 2002. This is the first change to their birthstone list since 1912. A pearl is a pearl – right?